This strange ornamental rhubarb has the most enormous maple shaped leaves. 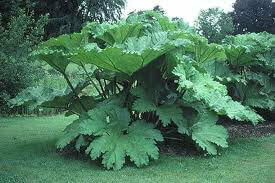 They are 1 - 1.5m across, held by fleshy rhubarb-like stalks. They love wet feet, so are perfect for around ponds, dams or boggy areas. They are a delight for children and adults alike, as it is 'land of the giants' for them.